We used to call it lemon honey when my grandmother made it. It was a real treat then and it’s a real treat now. I don’t know who came up with the idea of combining passionfruit and lemon but it was inspired. 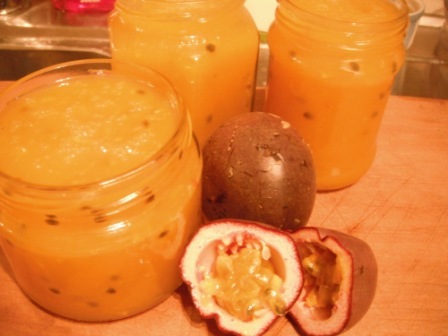 We had a rough start to our first passionfruit growing experience in the Wairarapa. The frost got the first one. The new vine is now safely beside the wood shed with a small eve protecting it. It’s doing well but didn’t bear a huge amount of fruit. Luckily the lemon tree has responded well to some extra tlc this year and is fruiting magnificently.